This brings to a close our second “Fan Flavor Contest”. Again, the winner will be stylin in a spanky new FrozBroz T-shirt as well as eating a pint of their suggested flavor. We had a great response and everyone offered an impressive array of flavors, some intriguing and some kinda scary. So thank you to everyone who participated, and congratulations to Adam Arling who was the winner of “Fan Flavor Contest” No. 2 with his flavor suggestion of Sweet and Sour Cream Cheese Wonton. When we make a flavor, conceptually, there are a number of different routes to take it. 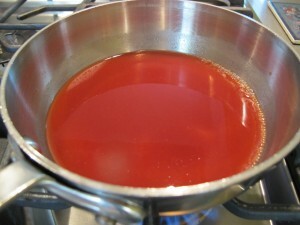 For this one, we both immediately knew that making a sweet and sour syrup to layer into the pints was the route for us. 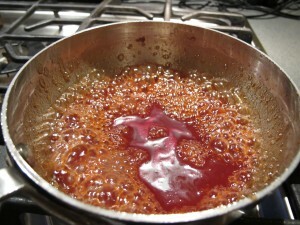 The sweet and sour syrup consists of a reduction of rice vinegar, tomato paste, sugar, pineapple chuckers, and last but not least…Sriracha Chili Sauce. We needed to reduce this mixture into a syrup instead of thickening with cornstarch, so we could evaporate as much of the water content as possible. After the syrup has reduced and thickened, we strain out the pineapple and tomato solids and we’re left with a nice sweet and sour syrup that doesn’t get icy when frozen in the ice cream. 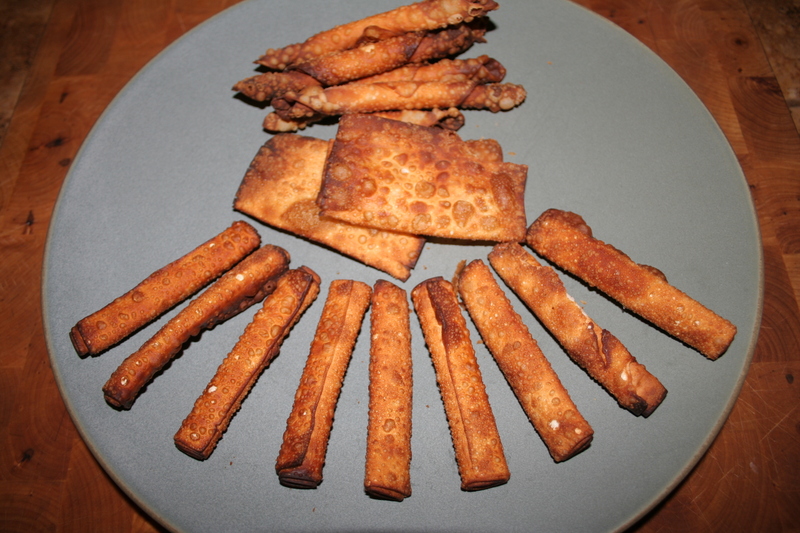 The wontons presented a challenge – so thin and fragile they’re likely to get soggy in the cream – so we took a double headed approach – some steeped in the cream to add the fried flavor, and others were rolled up before frying and dried in the oven after to get a maximum crunch. Will they hold up in the ice cream? Time will tell, but the wonton flavor is undeniable. Cream Cheese! We decided to mix this directly into our base . It makes for an ultra rich cheese cakey ice cream, along with all of the starches from steeping the base with fried wontons. 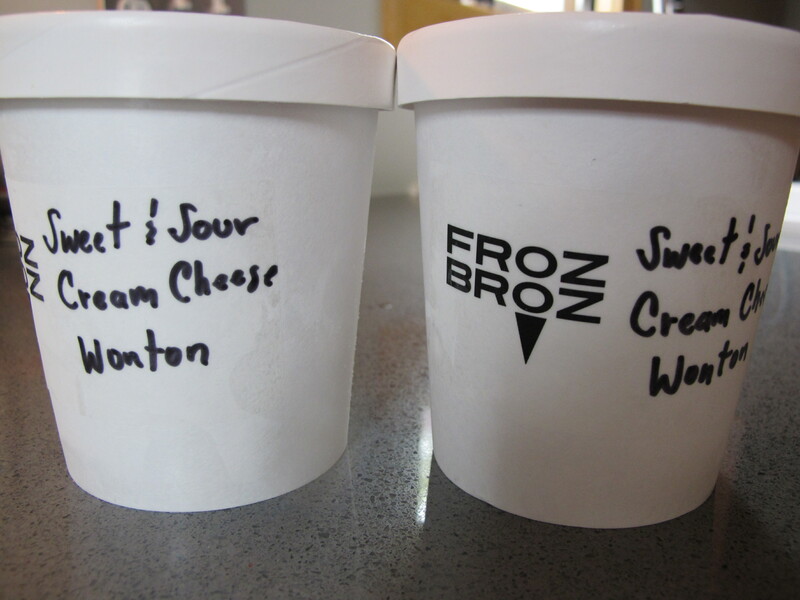 That wraps up or second “Fan Flavor Contest” with Adam’s suggestion of Sweet and Sour Cream Cheese Wonton FrozBroz style. Congrats Adam on the cray cray suggestion.! Four of us tried the Wonton ice cream last night. Three of us enjoyed it; it was a bit too “saucy” for the fourth person’s tastes (she’s sensitive to vinegar flavors). + The ice cream base is really tasty and creamy. 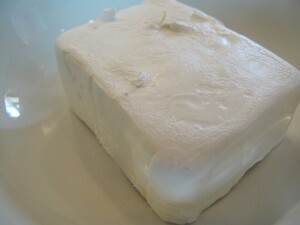 The cream cheese added smoothness to the base; we all felt that this base was exceptional in its texture. The flavor was mild, which was good so that it didn’t “fight” the sauce ribbons. + The sauce ribbons provided a good flavor contrast. It was a weird flavor for ice cream, but weird in a good way. We all enjoy funky desserts, so we really got into the fact that there was sweet n’ sour sauce in our ice cream! + The crunchy wonton bits added a nice texture contrast, and their flavor was appropriately wonton-y. Personally, these bits were my favorite aspect of the ice cream. + The other wonton bits were too mushy; they made it feel like the wonton bits were inconsistent. + The blending was inconsistent. Some bites were really strong with loads of sauce, while others were sauce-less. With much of the flavor coming from the sauce, we felt that the end product would be better if the ribbons were thinner and more evenly incorporated. + This same group of people tasted your Cardamom Basmati Pistachio ice cream, and we all agreed that we LOVED that one and LIKED this one. Please don’t forget about our Indiegogo fundraising – we have just under 26 days to go and need all the help we can get! 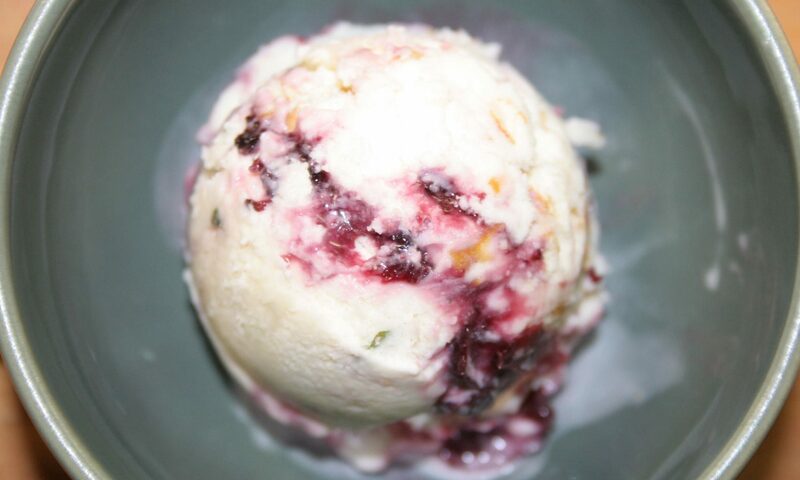 Help us meet our goal so we can start making our ice cream and getting it to all that want it.